Saskatchewan is known as the "breadbasket of Canada", referring to its strength as a primary producer of agricultural commodities and its contributions to the natural and applied sciences and biotechnology. The Food and Bioproduct Sciences Department has two main streams of research; food science and applied microbiology. Both of these areas involve the development and application of science and technology in pre- and post-harvest agriculture and in adding value to primary agriculture products. In recent years, interdisciplinary research between the two streams has resulted in improved food safety and security, which have pushed the research frontier beyond traditional food and microbial products. The Food and Bioproduct Sciences Department aims to fully utilize renewable bioresources to produce healthy foods and consumer acceptable bioproducts to support our health, the environment, and a sustainable bioeconomy. Applied microbiology is the study of the microbial world and the way it interacts with our own. It looks at how we can harness and utilize the powers of the microbes in areas ranging from biotechnology to pest control, to bio-refineries, to pharmaceutical applications. 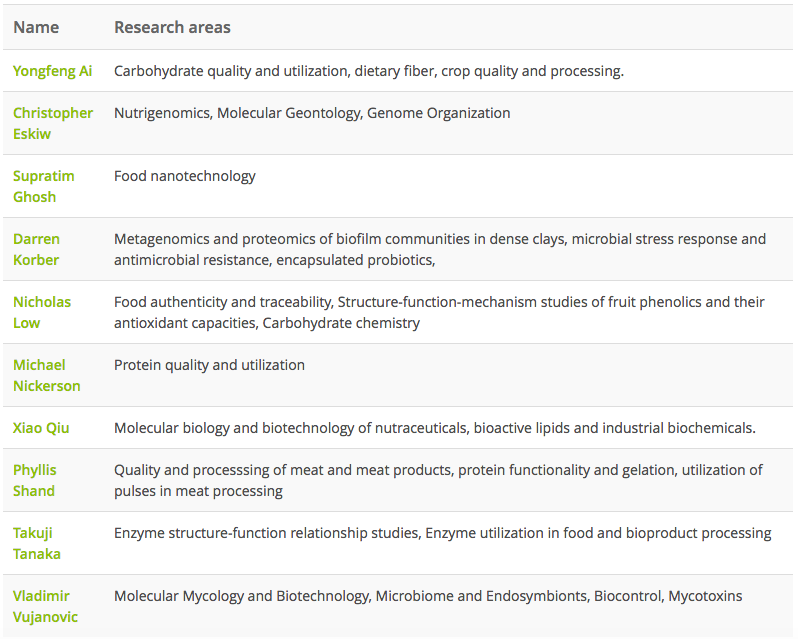 A wide range of microbial bioproducts is possible. Faculty interests include: value-added crop utilization; novel techniques to detect food adulteration and traceability; lipid quality, utilization and biotechnology; food nanotechnology; food enzymology; meat quality; functional foods, nutraceuticals and nutrigenomics; microbial bioproducts and biotechnology; fermentation and formulation technologies; food and environmental microbiology; carbohydrate quality and utilization; protein quality and utilization; biocontrol of molds and mycotoxins; and mycology. The Department of Food and Bioproduct Sciences is housed in the state-of-the-art College of Agriculture and Bioresources building, a prominent edifice on the beautiful U of S campus. This research-driven unit focuses on small class size, ready access to and help from faculty supervisors, and hands-on experiential training in numerous high-caliber facilities, including laboratories in: food and bioproduct chemistry and analysis; food microbiology; molecular and environmental microbiology; product development and sensory evaluation; biotechnology; and food and bioproduct processing. Students accepted into the P.G.D. and M.Agr. programs must be able to support themselves through their entire program as no financial support is available for them. They are also not eligible to apply for academic awards. Students accepted into the M.Sc. and Ph.D. programs receive financial support from their supervisor’s research funds. Students are also able to apply for academic awards and funds to support the student experience. In addition to potential funding from your department, there are scholarships and awards available to all eligible students. There are also special programs for international students from China, Vietnam, and Ecuador. Students in course-based programs pay tuition for each class they take. Every class is assigned a number of credit units (usually three) which determines the cost. If a student is not enrolled in any classes for a term, they will need to register in a 'Maintenance of Status' class that is 3 credits to stay in their program. An applicant’s suitability will be evaluated by the admissions committee based on background, marks, and space available. Applications for the M.Sc. and Ph.D. programs are accepted year round. - $4,137.00 for Canadian Students. $6,536.46 for International Students.